Electra Glide, Road Glide or Dyna Switchback! 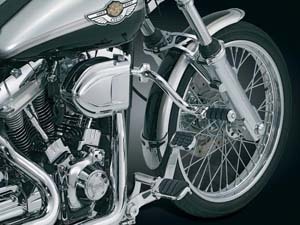 FMT-002: For all Harley models with 1 1/8” frames and without engine guards - FLH, FLR, FLT thru 2008, FLS (except Fat Boy, Deluxe and Springer) models. Also fits many other motorcycles with a 1 1/8” frames. The arms mount directly to the front frame down tubes. The mounts allow for an 8” range of motion; 4” forward or 4” backwards from the center line of the frame tubes, to fit any leg length, making it easy to adjust to your riding style and provide maximum comfort. The arm and peg have a combined length of 13”, clamp securely to the frame and they will not slip. 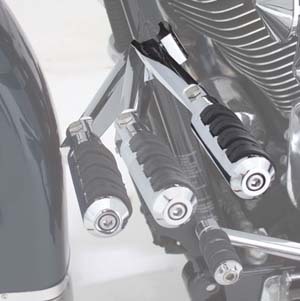 Includes anti-vibration pegs with exclusive angle adjustment locking set screws. 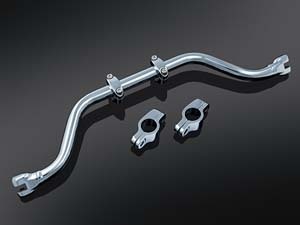 CNC machined from billet aluminum and triple chrome-plated, they also include all stainless steel hardware. Certain Wide Pegs and Highway Boards will not work with this product. To calculate the diameter easily, wrap a dollar bill around the frame tube, make a pencil mark where the bill overlaps, remove and measure the length between the marks. A 3 1/2" measurement will be the 1 1/8" size, the 4" will be the 1 1/4" size and the 4 11/16" will be the 1 1/2" size. FMS-003: Fit all Harley models with 1 ¼’ frames - XL Sportsters through 2003 (except Custom), FX Softail models, FLS Rocker, Duece, Deluxe, Cross Bones, Fat Boy (1999 and up) Softail models. 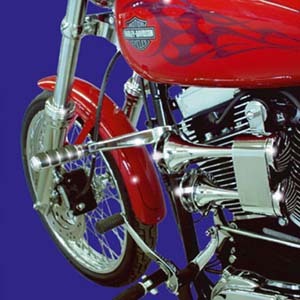 These mounts will also work on any motorcycle with a 1 1/4" frame, and fit all models without engine guards. 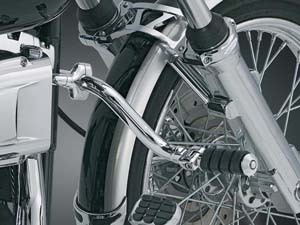 The arms mount directly to the front frame down tubes. The mounts allow for an 8” range of motion; 4” forward or 4” backwards from the center line of the frame tubes, to fit any leg length, making it easy to adjust to your riding style and provide maximum comfort. The arm and peg have a combined length of 13”, clamp securely to the frame and they will not slip. Includes anti-vibration pegs with exclusive angle adjustment locking set screws. CNC machined from billet aluminum and triple chrome-plated, they also include all stainless steel hardware. Fits most American and metric bikes with these frame sizes. NOTE: Certain Wide Pegs and Highway Boards will not work with this product. FMD-004: Fits all models with 1 ½” frames - all Dyna Models 1982 & up, also fits many other motorcycles with 1 ½” frames, and fit all models without engine guards. 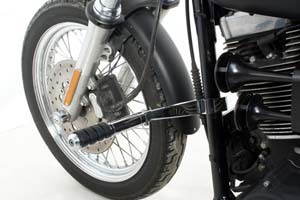 The arms mount directly to the front frame down tubes. The mounts allow for an 8” range of motion; 4” forward or 4” backwards from the center line of the frame tubes, to fit any leg length, making it easy to adjust to your riding style and provide maximum comfort. The arm and peg have a combined length of 13”, clamp securely to the frame and they will not slip. 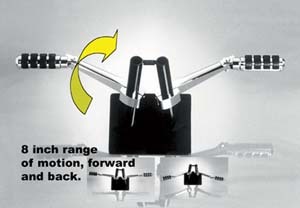 Includes anti-vibration pegs with exclusive angle adjustment locking set screws. CNC machined from billet aluminum and triple chrome-plated, they also include all stainless steel hardware. Note: Certain Wide Pegs and some Highway Boards will not work with this product. Fits: For 1 1/2" Tubes, FXDX/FXDL/FXD Dyna Series ‘93 and Up, FXDS Dyna Low Rider ’94 and Up, FXDWG Dyna Wide Glide ‘93 & Up, VICTORY Kingpin ‘05 & Up, VICTORY Hammer ’05 & Up, VICTORY 8-Ball ’05 & Up, VICTORY Hammer ’05 & Up. 7503: The great function of the mustache bar has stayed the same - adding the extra peg positions you need on those cramp-inducing hauls. The difference between old & new lies within the ability to be adjusted to fit virtually any rider. Due to its cleverly designed clamp system, this mustache bar can be moved up or down the downtubes & the bar can be rotated to provide multiple fore & aft adjustments. Ride on in comfort! 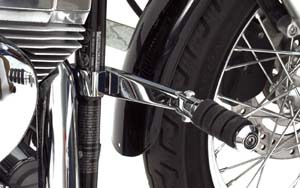 Accepts any H-D style male-mount pegs (sold separately). Adjustable Mustache Bar (ea). Fits: '91-'14 Dyna Models. 7502: Similar to above but fits: H-D: All ’86-'14 FLST, FXST & Rocker Models; Yamaha: All ’99-'14 Road Star, ‘08-'14 Raider Models & ‘98-’14 V Star 650 Models.